This node smooths a terrain by replacing the height of a vertex by the average of the height of its neighbors. This average value and the initial value are blended. To add a Smooth node, right click in the Graph Editor and select Create Node > Terrain Transformation > Smooth. 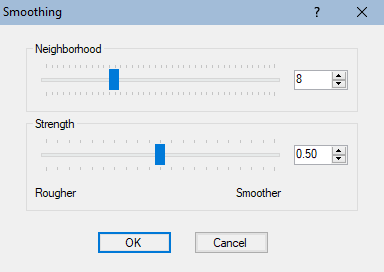 Neighborhood: Sets the size of the neighborhood to be taken into account in meters. For a size of 1, the 8 neighbors are taken into account. For a size of 2, the 8 immediate neighbors as well as the 16 second-rank neighbors are taken into account. The selected size is half the length of the square of the neighbors around the vertex. Strength: Sets the strength of the smoothing between 0 and 1. A value of 0 produces no effect. A value of 1 produces maximum smoothing.